Character. Coste: 1. FUE: 1. 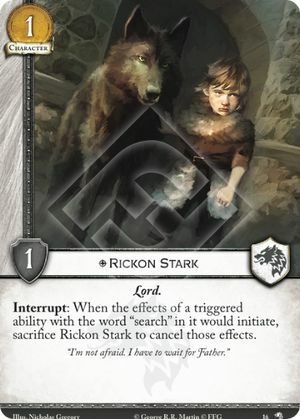 Interrupt: When the effects of a triggered ability with the word "search" in it would initiate, sacrifice Rickon Stark to cancel those effects. "I'm not afraid. I have to wait for Father." Wolves of the North #16.